From playwright Penelope Skinner, a photo she took at a diner last weekend. Fred's Diner starts previews TOMORROW! Here is the first of several posts offering a look inside the world of our production. 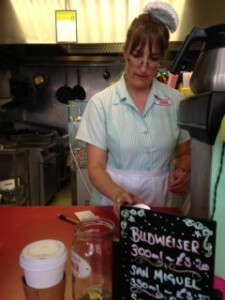 Fred's Diner is set in a roadside American-themed diner in England and, like much of Penelope Skinner's work, contains complex female characters -- in Fred's these are a trio of waitresses. The women of Fred's Diner rock. So I looked into waitress culture specifically. 1. Women will work for less pay. 2. Women won't stay out late drinking and call in sick the next day. 3. Women belong around food. 4. Women will work harder than men. 5. Women are always happy. 6. Women are more efficient workers. 7. Women are more honest than men-- they don't steal. 8. Women can talk and work at the same time. 9. Women clean diners better than men. 10. Women are cleaner than men. 11. The customers like women better. *Watching The Theory of Everything. ** Taylor, Candacy. Counter Culture: The American Coffeeshop Waitress. ILR Press: 2009.